Jonathan Lu is about to step into the biggest shoes in Chinese e-commerce. The 43 year-old Alibaba executive has been named as chief executive, succeeding billionaire company founder Jack Ma, who is resigning to make way for younger leaders. Ma and several partners launched the company from his apartment in Hangzhou in 1999. 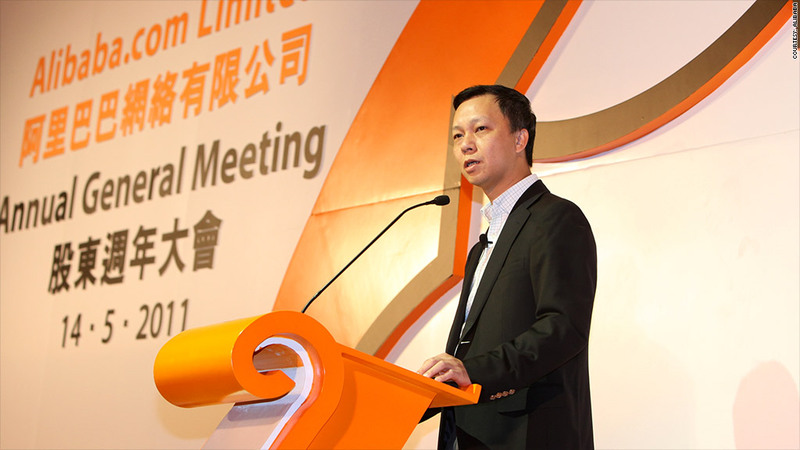 He will continue to set Alibaba's strategic direction and develop future leaders, but hand over his responsibilities as chief executive to Lu by May 10. Lu joined Alibaba in 2000 and is the only senior company executive to have headed all of its major divisions. Alibaba's company blog describes him as an operations whiz who shuns the spotlight. His ability to execute will be tested immediately. In January, the company said it was splitting operations into 25 divisions to become more flexible. Lu led the development of online payments service Alipay. Later, as chief executive of Tabao, the dominant e-commerce site in China, he oversaw an eight-fold increase in value of goods traded on the platform. "Serving as Alibaba Group CEO is an extremely challenging and difficult job, especially succeeding a founder CEO like me," Ma wrote in a letter to employees obtained by CNNMoney. "I strongly believe that with all your support and assistance, he can lead Alibaba Group to achieve even more seemingly impossible things in our pursuit of building a business ecosystem." Alibaba said Lu had laid the groundwork for early development of Taobao's group shopping initiative, known as Juhuasuan, and oversaw the development and early growth of Taobao Mall, a service that lets consumers buy goods directly from retailers online. Most recently he served as chief data officer, building a data-sharing platform for small businesses and consumers, and had responsibility for the group's Aliyun mobile operating system. Before joining Alibaba, Lu worked in the hotel industry and co-founded a network communication company. Ma, 48, said in January he wanted to make way for younger Alibaba executives with "better, more brilliant dreams than mine". Yahoo (YHOO) once owned 40% of Alibaba, but sold back about half its stake in the company last year after a series of disputes soured the relationship.